*As of right now, Director's Cuts of the other issues have not been solicited. 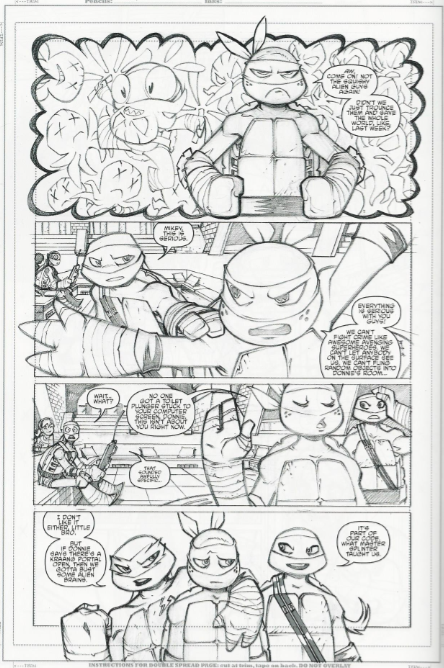 In the past, Director's Cuts have only been released for the first issue of these TMNT crossovers, so I wouldn't hold my breath if I were you. 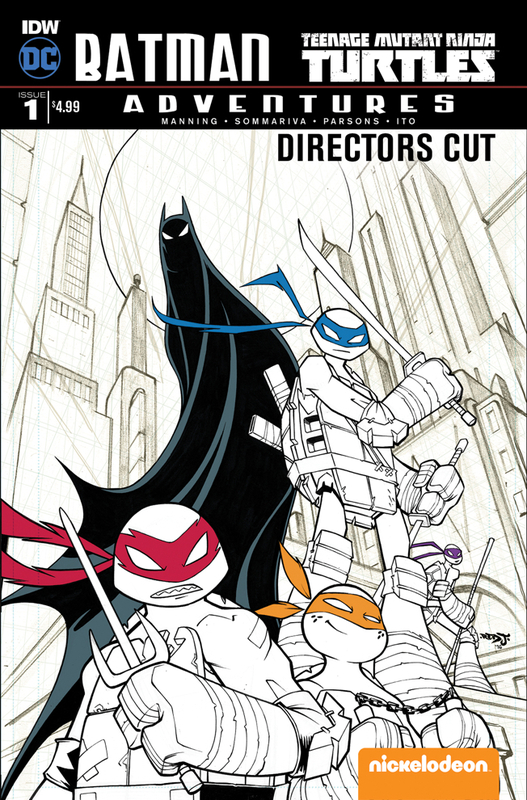 These Director's Cut specials for IDW's recent TMNT crossovers have been an interesting bonus. I picked up the TMNT/Ghostbusters one (published by IDW) as well as the Batman/TMNT one (published by DC) and enjoyed them both. What's interesting, at least to me, is to see what the different publishers choose to focus on for their versions. When DC did the Director's Cut for Batman/TMNT, the spotlight was exclusively on the artwork with no behind-the-scenes input from the writer. 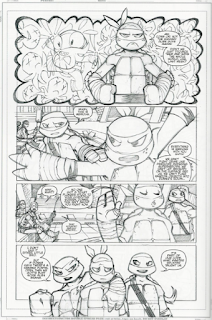 The IDW publications for TMNT/Ghostbusters and now Batman/TMNT Adventures are much more balanced, giving us a look at the artist's pencils but also notes from the writer. In the case of Batman/TMNT Adventures, the author's notes section is considerably reduced from what we saw in the TMNT/Ghostbusters Director's Cut. Rather than get a play-by-play commentary, picking out references and Easter eggs for the reader, we get a 3-page retrospective from Manning and a few captioned images with notes from Sommariva. It's not as extensive as past Director's Cuts, but I'm glad that both the artist AND the writer are given the chance to talk about their experience on the book. Manning's afterword isn't that detailed regarding the issue-itself, but is more an anecdote about how he first encountered both Batman and the Turtles as a kid. There's a funny/sad story in there about his first visit to New York City and how a crook stole all of his TMNT action figures. Poor kid. Sommariva's notes are a bit more technical, as he captions photographs of his work space and the tools he uses when drawing. Evidently, Sommariva still uses boards, pencils and pens, so his artwork is entirely tactile, at least until the coloring and polishing stage. Most artists these days have transitioned entirely to tablets, so it's nice to still see old fashioned pencil-work. Overall, I did find this Director's Cut to be a bit skimpier than the previous two, but at $4.99 it is certainly a great value. And shorter in content though it may be, you DO get to hear the perspectives from both the writer and the artist, and that's always welcome. It's certainly a good buy if you want to see Sommariva's pencils, and it won't break the bank. I greatly appreciated the page count value for the price. And I prefer writer's notes over pencils. Curious how there were plans to include a Teens Titans Go! reference but that was nixed because of the meta-problems of a cartoon about Robin in the BTAS universe. So they settled for just Ponies.